Rob Schwalb is probably best known for his work on 3rd, 4th, and 5th edition (“new school”) D&D, though he has also worked on many other RPG properties, including Green Ronin’s Song of Ice and Fire tie-in, Warhammer, Witch Hunter, and Numenera. 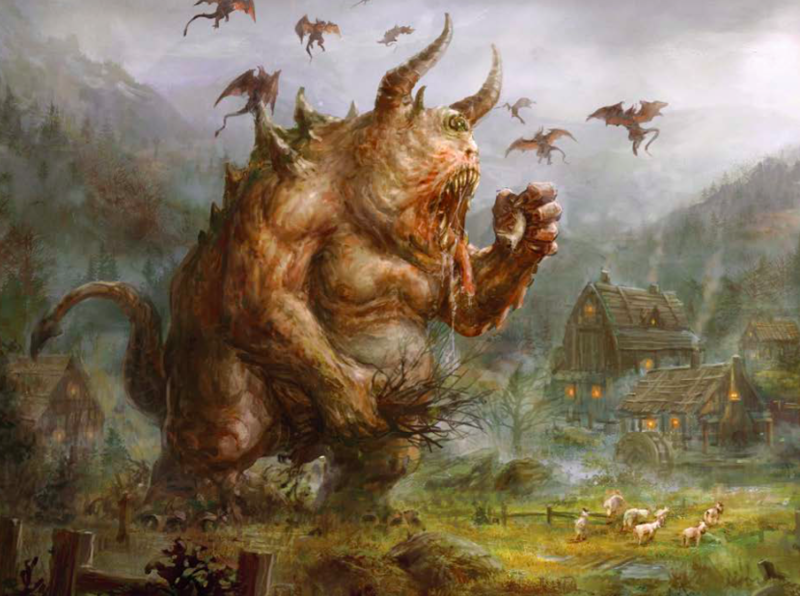 Shadow of the Demon Lord is a solo effort, originally crowd-funded. The short overview is that it is a (dark) high fantasy setting with some innovative and streamlined mechanics, both in the core engine and in the character build system. Like many non-indie games, it does not provide much in the way of referee procedures, instead trusting that you more or less know how to run RPGs already, but in this regard it is no worse than games like D&D 5, the AGE system, or various Fantasy Flight 40K titles (just for a few examples). Engine. SotDL will be easily recognized as a d20 game. The two major resolution systems (attack rolls and challenge rolls) are d20, roll high and represent fictional results at a rather low level of abstraction. For example, attacking with a weapon or climbing a wall. Attacks are d20 plus some ability versus opponent defense (basically, AC). The other resolution system is the Challenge Roll which is a target 10 ability check. For both systems, bonuses and penalties are applied by rolling some number of d6s and taking the greatest result (much like the advantage rule in D&D 5, but only applied to the bonus dice and with more than two dice possible). The positive dice are called boons, the negative banes, and they cancel so that 2 boons and 1 bane reduces to a single boon. This sounds like a fun approach that also restrains potential bonus inflation. The fast turn/slow turn approach to combat looks promising. Players always get to act first but combat turns proceed in two phases. Player fast actions are followed by enemy fast actions. Then, player slow actions are resolved followed by enemy slow actions. Each combatant only gets to take one action of either type generally, however, so opting to take a slow action (like casting a spell) means that you grant the enemy initiative. This is a rich tactical tradeoff that also obviates the traditional initiative overhead, which in my opinion often does not offer much in terms of gameplay beyond the casino uncertainty of simple side-based initiative as suggested by Moldvay Basic D&D. Character Build System. There are around 50 pages of class options and that does not include spells (a separate chapter of almost 40 pages), “ancestries” (that is, races), or “professions” (that is, backgrounds). This means that more than a third of the 272 page book is made up of essentially character build options. That may sound somewhat damning to anyone (like me) for whom character optimization feels like homework. However, it’s actually done very cleverly. Characters don’t have levels. Instead, the group as a whole has a level and there are advancement rules for up to level 10. Player characters begin at level zero and gain a class (“novice path”) at first level which is expected to be at the end of the first session. The novice paths are takes on the classic 4: magician, priest, rogue, and warrior. As characters advance, they gain an expert path at level 3 and a master path at level 7. Extra abilities from each path (and ancestry) factor in regularly as the group gains levels. For example, the advancement that comes from attaining level 6 comes from the expert path that was chosen at level 3. This means the various path abilities are interleaved trough character development rather than sequentially gained, such as with Warhammer style careers or D&D 3 prestige classes. It feels tight. Most interestingly, the consideration set of path options explodes at each tier. There are 4 novice paths, 16 expert paths, and 64 master paths. Though there some clearly related sequential choices, there are no prerequisites. A character could be a magician, wizard, necromancer or a magician, wizard, sharpshooter. In all, there are 4096 basic class combinations just considering the paths. Recall that on top of the three paths, there are also ancestries, professions, and spells (for magic-using characters). The paths are laid out in a way that is not intimidating to me (which I rate as a significant achievement considering how I generally react to extensive character build options). This kind of flexible, cross-archetype advancement was pretty much what I was going for back when I was working on the initial version of Hexagram (prior to The Final Castle), and as far as I can tell is completely realized here. And, it largely avoids the mess created by most multi-classing approaches. So, A+. The slow unfolding of character options is a wonderful example of smart game design that seems like it would serve many kinds of player well. I have not read the options closely enough to know whether they are exploitable in the sense of being able to create a much more effective character based on rules mastery, but my general impression is that this danger is minimal. I also doubt initial character creation would take more time than Basic D&D. Select an ancestry, roll for or select a few ancestry background details, roll for or select a profession, roll for gear by starting wealth, and you are done. There is a standard battery of personality type questions, but they are really just suggestive and could easily be skipped in favor of just extrapolating based on the other background info or developed in play. Referee Procedures. 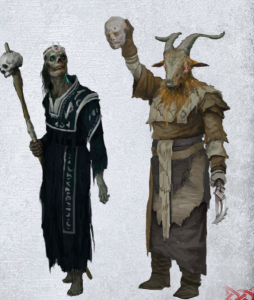 SotDL addresses how to run the game in chapter 9 which runs a bit under 40 pages. Most games within the D&D tradition have rather weak or only implied referee procedures, especially in second edition and beyond. Random encounters become relegated to optional subsystems and subservient to satisfying narrative development. Impartial game resolution is often deemphasized or eliminated within this tradition. Instead, fiction-derived and player satisfaction principles dominate, with deference to hero journeys, three-act plots, and ensuring that every player gets a chance to shine. The referee guidelines remain mostly within this paradigm. The first part of the chapter is tips about how to use the resolution systems (when to call for a challenge roll, for example). There are some notes about intended theme and how to convey horror, terror, and revulsion at a high, conceptual level. There are some good principles buried within, such as thinking about and planning roughly for at least three adventure conclusions, corresponding to success, failure, and partial success respectively. This approach would ensure that player actions have an effect on the story development which I find more satisfying than predetermined plot. The Shadow eclipses the sun, turning it black. Impossibly, light still emanates from the shadowed disk, but it is brown, sickly, and unwholesome. The sun’s gentle warmth becomes a hellish furnace, destroying life as the landscape becomes a bone-strewn dustbowl. In addition to setting changes, some Shadow results come with minor mechanical modifications, such as making certain kinds of monsters more difficult, though as far as I can tell that is mostly a sideshow. Most Shadow results are pleasingly substantive and many have further specific tables to help flesh out the results. The Shadow system is useful and does real work for the referee beyond just communicating good advice, which is really the tabletop RPG equivalent of broscience. The system could probably easily be bolted on to other games as an corruption event generator or magic catastrophe table. It is also worth noting that that advancement scheme is designed around a limited number of sessions (10 or 11) rather than the traditional perpetual RPG campaign. This seems like a good idea to encourage concluding campaigns with a sense of closure rather than seeing them fade away due to waning interest or life intervening (players moving away, and so forth) but such an approach could also be applied to most systems without too much effort. Setting. As presented, the default setting of Urth is surprisingly high fantasy. I was expecting something somewhat more restrained, or at least thematically consistent. Something like the early entires in the Diablo franchise or perhaps a realization of metal album covers. Instead, the setting is flying castles, institutionalized magic, and demi-humans everywhere. This is a matter of taste, but for me this detracts somewhat from wonder and horror. It feels a bit like someone took all the extra awesome things from the genre toolbox and jammed them into the same setting. Steampunk clockwork! Super-metal demons! Weird west gunfighters! So far, there is little established canon, however, so players should be unlikely to come to a game with very strong content expectations and this could easily be tuned or replaced by the referee. The level of setting detail reminds me of nearby market alternatives such as Numenera. Overall, this part of the book is neutral for me. Roughly one-sixth of the book is monsters, which are arguably setting content as well, and while some of them are generic, many are creative. They probably deserve more attention in this review, but the post is already running long. I may discuss them more in a future post. Bottomline. If you are going to have a tabletop RPG with a zillion classes but you do not want it to feel overwhelming to more casual players, this is a good way to do it. Unfortunately, the PDF is not bundled with the hardcopy. Perhaps it is a bit unfair to criticize, but given standard industry practice, this makes me feel like I am being charged twice for the same content. The total cost for me was $46 (hardcopy) + $10 (US shipping) + $20 (PDF) = $76. In the end, I decided that it was worth it to me, but it caused some internal grumbling. You can buy the PDF or pre-oder the physical book here. The physical book has not shipped yet, but Rob confirmed on G+ to me that the binding is stitched (yay!). I will make another note here once I have confirmed that in person. The expected delivery is currently December 2015. Images used in this post were extracted from PDF screen shots of art in the book that I liked. I do not think all of the art is this good, but there are a lot more pictures not featured here that I also liked. This entry was posted in Reviews on November 20, 2015 by Necropraxis. I didn’t know that he was on the design team for 5E; which I also really enjoy from this perspective, but I think the games have a few things in common; although SotDL strives for a different fantasy of course. Setting wise, I’m totally with you. Although I like having the character options of clockwork characters, I feel these and other demihumans shouldn’t be that common. Flying castles? OMG, no. In SotDL I’d go for a different feel instead; although I wouldn’t ban magic, given that it is such an interesting driver in the game play. I also like Schwalb’s approach to magic. It is there to be used, but how you came to utilize those powers is up to you. If you can explain it away as something else (advanced tech? ), you could feasibly do so, as long as you follow all the rules. Technomancy is giving me exactly that feeling. If I have something to grunt about, it would be that there are a lot of attack spells really. I don’t think that a game has need for that many types of offensive spells. When I looked at Necromancy, I was trying to find Utility spells that let me talk to the dead, see what they have witnessed before dying and other interesting things that most definitely have a morbid feel to them. 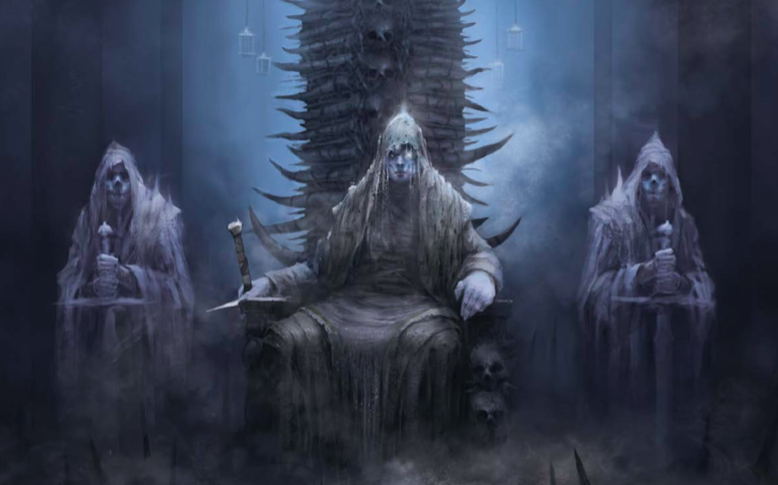 Yet the tradition is stuffed with offensive spells – okay, don’t mind having options, and of course it is a brutal practice, but what about the actual “death oracle” of necromancy? No? That’s one point of critique that I have. And I feel that this can easily be house-ruled with new spells.